A blaze erupted at a timber shop in Mumbai's suburban Andheri area on Tuesday according to several media reports. No one has been reported injured. 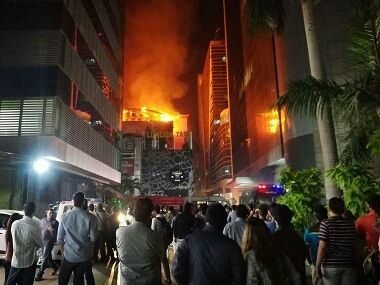 This is the sixth major fire incident in Mumbai in the past few days, and the third since Monday. According to ANI , three fire engines and as many water tankers were rushed to Amboli Naka in Andheri's SV Road, where a bamboo godown went up in flames. The area features a close-knit market of timber, bamboo and furniture shops, with a teeming marketplace nearby. The blaze was reported at 5.37 pm and five fire engines were rushed to the spot. "The fire at the bamboo godown has been brought under control," a fire brigade official said, adding no casualties have been reported. A fire broke out just past midnight in a shop in a chawl in Dockyard Road, Byculla, a senior fire brigade official said. "Six fire engines and water tankers were rushed to the spot and they doused the flames in less than two hours (by 2 am)," he said, adding no one was injured. In the second incident, the fire brigade control room received a call at 10 am about a fire in a ground plus three-storey residential apartment on Juhu Tara Road in suburban Vile Parle. "Fire brigade personnel immediately rushed to the spot and put out the blaze within 25 minutes," the official said, adding no one was injured. The cause of the fire at all the three places was not yet known. The financial capital has been hit by a string of fire incidents in the last fortnight. The deadliest of them was on 29 December when a devastating inferno killed 14 people at an upscale pub in the Kamala Mills Compound. On 4 January, four persons, including two children, were killed and five others seriously injured after an upper floor of a residential building in suburban Marol caught fire. A 20-year-old man, who worked for a television serial production unit, was killed in a fire at the Cinevista film studio in suburban Kanjurmarg on 6 January. Before this, on Monday, another fire incident was reported from Mumbai's sessions court located near the campus of the Mumbai University in the southern parts of the city. Though the building did not suffer any major damage, some official records and electrical wiring was gutted. On 18 December, 12 labourers were killed in a massive blaze at a snack-making unit in Saki Naka-Kurla. As the metropolis battles frequent blazes, the fire department urged people and commercial establishments to take preventive measures. "Safety measures are a must to avoid such incidents. Apart from taking preventive steps, people should be alert and immediately inform the department about such incidents," said Deputy Chief Fire Officer Kailash Hivrale. People should keep a watch on electrical wiring in residential buildings and commercial outlets, he said. Meanwhile, BJP Member of Parliament Kirit Somaiya visited three film and TV studios after the fire at Cinevista. they don't have fire safety systems in place. I told this to the municipal commissioner and demanded strong action against these studios," said the Mumbai North-East MP.